Services provided: Branding, web design and development, event planning, content marketing, video services, social media, media relations and campaign and event management. 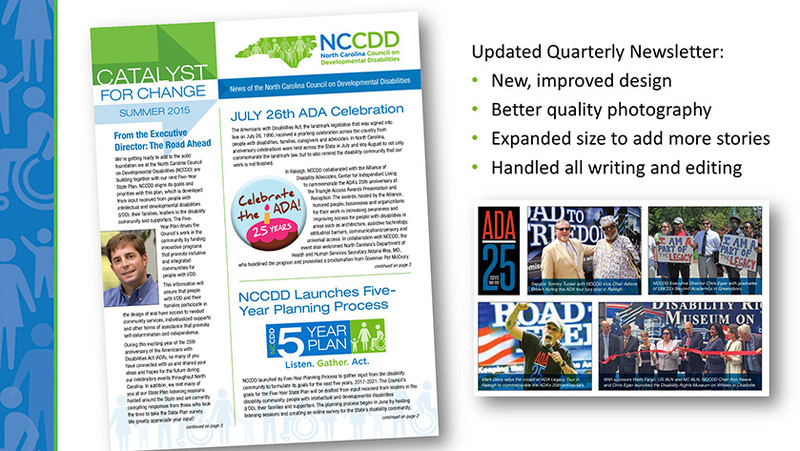 Educating and informing individuals with I/DD, their families, policy makers and the general public about the mission and systems change initiatives of the NCCDD across the state of North Carolina. The Council had a limited reach and lack of awareness in the community of its work. The firm was tasked to develop and implement a strategic marketing and communications plan to increased brand and community awareness across the State. 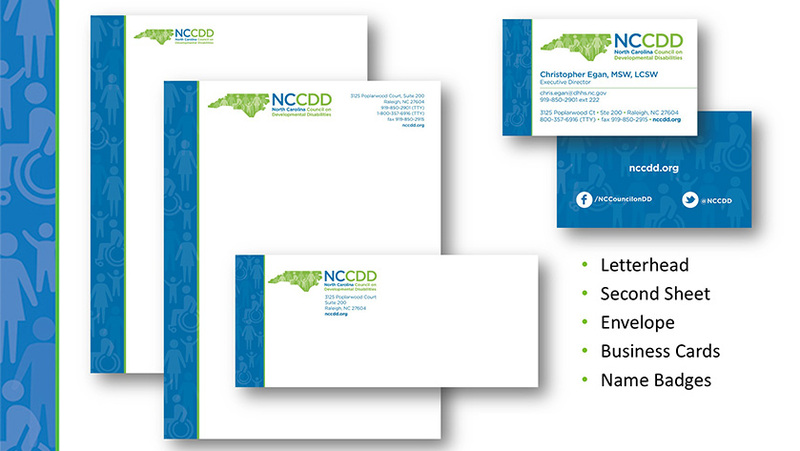 The NCCDD communications initiative participated in information gathering activities such as focus groups, material research and interviews to formulate a strategic implementation plan to revitalize the NCCDD brand. 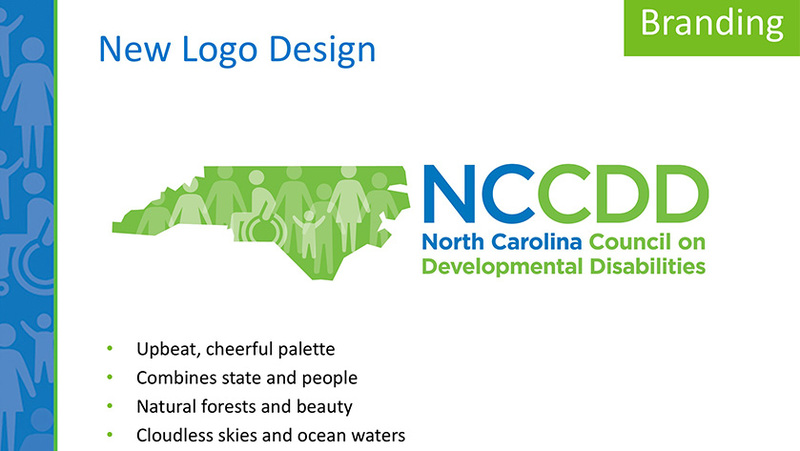 The firm designed a new logo to represent the State of North Carolina and also the Council’s statewide reach in the I/DD community. 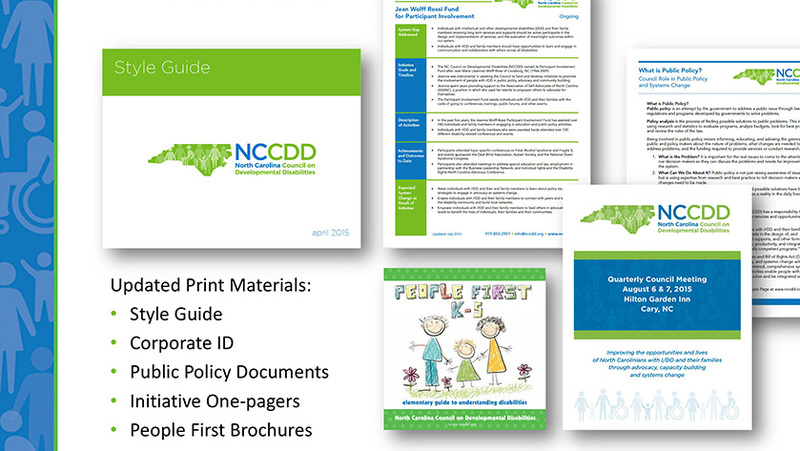 The branding efforts were expanded into digital graphics, corporate ID and print collateral such as the People First brochures, Council meeting packets and newsletters. 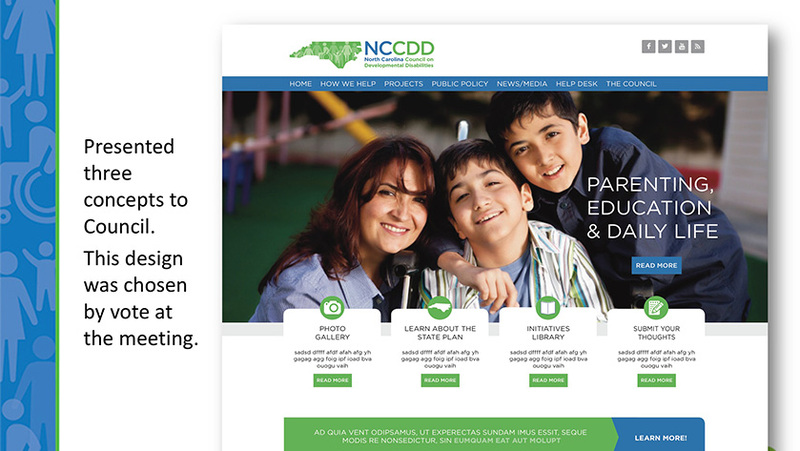 Through a complete redesign of the NCCDD website, the website received major improvements including easy navigation, streamlining with the brand and its colors. The website was also designed to be responsive to mobile devices and tablets and compliant with Section 508 to make website accessible for people with disabilities who use assistive technology like JAWS. The firm then implemented an aggressive communications and public relations campaign to continue building statewide, regional and local awareness. Through its efforts, O’Neill Communications organized and executed four special events around the 25th anniversary of the Americans with Disabilities Act. The events were held in Raleigh, Greensboro and Charlotte, North Carolina. The communications team generated marketing and outreach through social media sources including Facebook, Twitter, email marketing and blogging. The development and design of a mobile friendly and accessible website resulted in bounce rate that reduced by 20 percent, page duration was up by two minutes and the site received 75 percent new visitors since its launch. 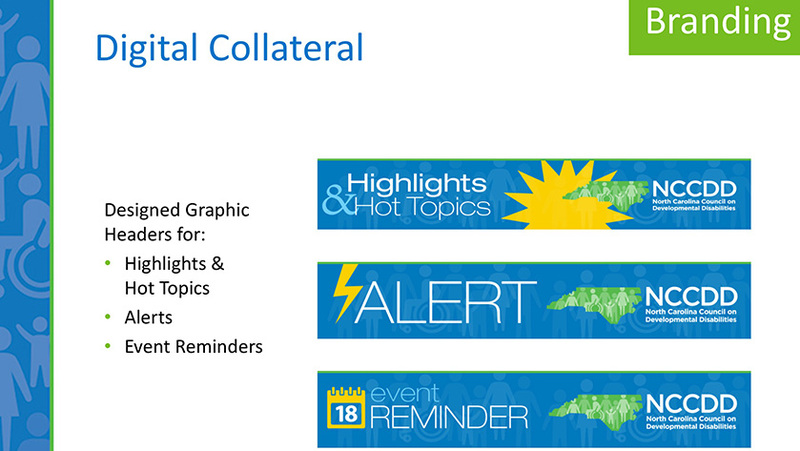 Expanded media relations efforts resulted in coverage in major and local markets such as WRAL (Raleigh), The News & Observer (Charlotte), Triangle Business Journal (Raleigh) and more. The email marketing and social media campaign resulted in a 20 percent growth of Facebook fans; 48 percent growth in Twitter followers; and 450 new subscribers to the newsletters. 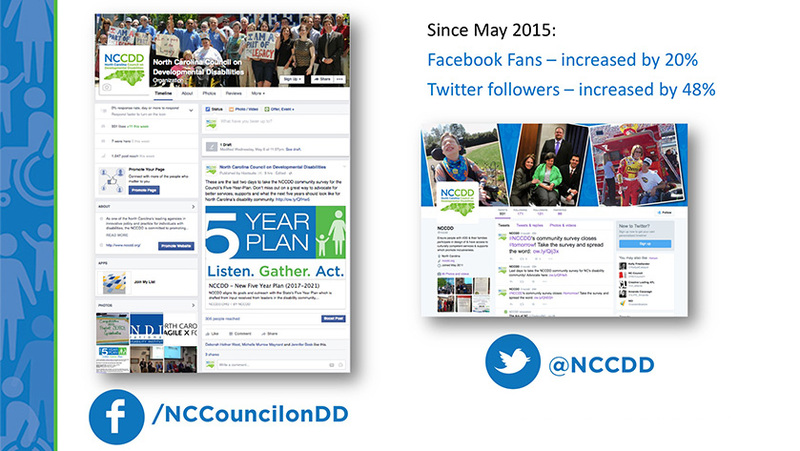 O’Neill Communications is currently in year two of its contract with NCCDD.